Mrs. Pidgeon’s second grade class is counting the days until February vacation. With just ten days until the school vacation begins, Mrs. Pidgeon’s class celebrates Valentine’s Day, a couple of Presidents’ birthdays, practices math facts, studies geography, and tromps around in the snow during recess. Some of the students in Gooney Bird’s class are taking exciting vacations – to Vermont, Hawaii, and Florida. But most of the classmates will be staying home in Watertower. When the vacationers begin to brag constantly about their vacations, Gooney Bird hatches a plan to show them just how it feels when others gloat, and it involves a very large “frozen” map of the United States that the class, with the help of the school custodian, Mr. Furillo, outlines in the snow-covered playground. By the end of the story, everyone is happy about the map project, and the gloaters tone down their vacation bragging. The book culminates with Mrs. Pidgeon’s class presenting a program to the entire school about the various states they’ve studied, using their outdoor map in the snow. 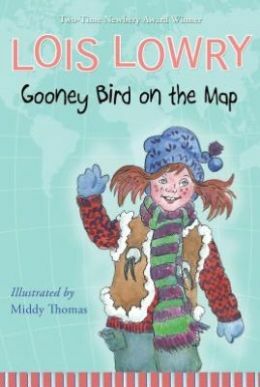 Author Lois Lowry uses this story of Gooney Bird, which is one of several Gooney Bird installations, to teach geography concepts in an interesting, yet subtle way. She makes Mrs. Pidgeon’s classroom seem like a happy place to be, where much learning – and fun – takes place. A fun reading activity to continue the geography concepts introduced or taught by author Lowry might be to place a large United States map on the wall and encourage the children to place sticker-flags on the states they have visited.